Hello friends in this web tutorial we are going to discuss how can we insert data into mysql table through Bootstrap Modal by using php script with Ajax jquery without page refresh. In previous tutorial on Bootstrap Modal we have show dynamic data from database to Bootstrap Modal by using PHP with Ajax jquery. Bootstrap Modal is a pop up or dialog box that appeared on top of the web page. Bootstrap Modal is used from displaying dynamic data from database to pop dialog box, in Bootstrap Modal we can also create form also, so we can also use Bootstrap Modal for inserting or updating of database data also. By using this plugin we can insert or fetch data without open new page, but we can do on page without opening of new web page. 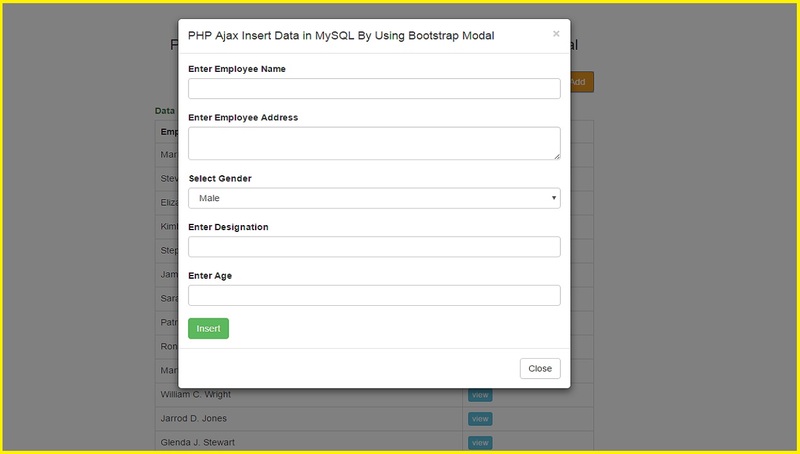 This is the modern concept of insert data through Bootstrap Modal by using Ajax request method and it has been send request to php script and php script has clean data and insert into mysql table and after inserting data success fully then after we want to show inserted on web page, in php script we have fetch data from mysql table and send back data to ajax request method in html form. And by using jquery code we have display that html data on web page. This all process has been done without page refresh event. By using Bootstrap Modal we have done all type of crud operation by using Ajax with Jquery and PHP. can u give me the code for 'delete data'?? it would be great ..
Hi, I've used downloaded the code from your site and set it in my local server. Everything is fine except the 'INSERTION' isn't working. When I try to add data, it says inserting and modal closes but it never inserts data into DB. Any idea what I'm doing wrong? There's no problem with DB connection just so you know.